A small but affluent Orange County city, with a current staff of only a half dozen employees, would have to pay about $3.6 million to leave CalPERS, the giant state pension system estimated two years ago. Villa Park officials say the city, population 5,800, is unlikely to leave CalPERS because of the big exit cost. But last week the city council directed staff to prepare a “notice of intent” to terminate the pension plan for consideration at a meeting Sept. 23. The notice would trigger an updated CalPERS estimate of the “unfunded termination liability” ($3.6 million as of June 30, 2012) needed to pay pensions promised 30 city employees: seven active, 13 retired and ten transferred or separated. Both Mayor Rick Barnett and Councilwoman Deborah Pauly talked about doing a public service by airing the large cost for terminating the pensions of a small city staff that does not include police and firefighters, services provided through the county. “I almost feel like just handing this to a reporter and saying, ‘Look at this. This for a city the size of Villa Park, the size of staff of Villa Park. Take this and multiply it for another city and see where we really are.’ I mean, Geez Louise, remarkable,” said Pauly. Villa Park, with a median household income of $153,000, is not one of the cities hit hard by a pension squeeze. Retirement costs are 15 to 20 percent of the general fund in Los Angeles, San Diego and San Jose, taking money from other services. The Villa Park general fund budget spends $2.7 million this year and has a $1.3 million reserve. The CalPERS employer rate for Villa Park is 22.7 percent of pay, far below some police and firefighter rates of 50 percent of pay or more. Pauly said the current Villa Park employer payment to CalPERS is about $110,000 this year, little changed since 2009-10 as employee contributions increased from 1 percent of pay to 6 percent of pay, covering much of the increased cost. Pensions are a fiscally irresponsible blank check. Most revenue comes from unpredictable investments, and costs are increasingly unpredictable as technology improves longevity. The private sector is phasing out pensions to avoid debt and risk. Pension systems conceal massive debt to avoid political pressure for change. Investment earnings forecasts (7.5 percent annually for CalPERS) are too optimistic. Debt calculations and installment payments are manipulated. Barnett suggested that the termination notice contain “whereas” clauses stating that pensions are an unsustainable and unjustified taxpayer burden, a breach of fiduciary duty to city residents and the result of unconstrained public employee union lobbying. 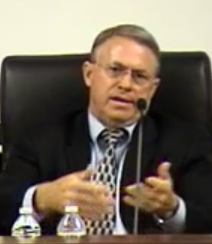 Later in the council discussion Barnett compared pensions to a “Ponzi scheme,” where money needed to pay earlier investors comes from new investors. Leaving CalPERS would close the Villa Park pension plan to new members. Gov. Brown made the Ponzi comparison when the California Public Employees Retirement System said employer costs could be increased by his proposed federal-style hybrid plan, combining a small pension with a 401(k)-style individual investment plan. “When I read the PERS analysis they say if you close the system of defined benefit (pensions) and don’t let any more people in, then the system would become shaky — well, that tells you you’ve got a Ponzi scheme,” Brown told a legislative hearing in December 2011. 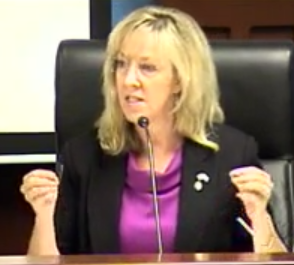 Brown disagreed with the CalPERS analysis, saying the pension plan would not need to be closed. But the Legislature rejected the hybrid when most of the other parts of the governor’s 12-point pension reform were approved two years ago. The notice of intent to terminate being considered by Villa Park would begin a process that, if carried out, gives CalPERS some rare but brief power under current state law. State court decisions are widely believed to mean that the pension offered on the date of hire can’t be cut unless offset by a new benefit of comparable value. Even retroactive pension increases made after decades on the job can’t be cut. But if a government employer cannot pay all of the debt owed for a terminated plan, the CalPERS board has the power to evenly cut the pensions of current workers and retirees to an amount covered by what the city was able to pay. Determining the debt owed for pensions promised current workers and retirees, some of which are obligations likely to continue for more than 50 years, is important for other reasons. When a plan is terminated, CalPERS becomes responsible for paying the promised pensions. The brief power to cut pensions ends when the termination transfer is completed. CalPERS cannot go back to the government employer or employees and get more money (the Ponzi angle), if long-term investment and demographic forecasts miss the mark and funding falls short. There may be a possibility that CalPERS could, if the shortfall is not too large, dip into the pension funds of other employers to continue making the pension payments. But that might invite legal and moral challenges. So, the debt owed for a terminated CalPERS plan balloons, driven by an earnings forecast based on a low risk-free bond rate, not the higher forecast for the diversified portfolio of an active plan still getting adjustable employer-employee contributions. The latest CalPERS Villa Park actuarial valuation as of June 30, 2012, uses a 2.98 percent risk-free bond earnings forecast to calculate a hypothetical termination debt of $3.6 million, well below the regular 7.5 percent forecast for investments. “With this change, CalPERS increased benefit security for members while limiting its funding risk,” said the valuation. Two other cities, Canyon Lake and Pacific Grove, reportedly wanted to leave CalPERS but did not because of high termination costs. Could cities close plans to new hires and continue CalPERS contributions as usual for employees already in the plan? There would be little immediate savings for employers. And if under current law or policy there is a way for employers to close their CalPERS plans without terminating, they apparently are not pursuing it. This entry was posted on September 2, 2014 at 7:38 am and is filed under CalPERS, Operations. You can follow any responses to this entry through the RSS 2.0 feed. You can skip to the end and leave a response. Pinging is currently not allowed. That is one of the clearest and most accurate descriptions of the issue I have seen in quite some time. The key to this Article is “Could cities close plans to new hires and continue contributions as usual for employees already in the plan?” If so, that would avoid the termination penalty which is currently about an additional 150% of the agency’s unfunded liability. Here in Pacific Grove, the unfunded liability is about 45-50 million dollars, but the “projected termination liability” is $125 million. Pacific Grove is a city of 15,000 people. It is primarily residential. Hopefully after the next election, the new mayor and council will bring a declaratory relief action, wherein the city contends that it can and will close its plan to new hires and has a right to stay in the plan for current and past employees, subject to market risks, as before, but without the additional 150% termination penalty. I disagree with the statement that pensions can only be reduced by giving something of equal value. Per Kern v, City of Long Beach that is the rule if a city’s pension plan is not in danger of collapse, such as was the case in Kern, and apparently Villa Park. In Kern, the Supreme Court cited two cases where the pension plan had lost its integrity(the ability to pay full pensions) and noted that in one case it allowed the city to reduce a 2/3 of final salary retirement amount to 1/2 and in another case it had allowed a reduction to pensions based on income earned during retirement. The analogy to Ponzi schemes, whether from the Governor or Barnett, mainly embarrass those who make the analogies. As does the claim that the pension problems are due solely to labor lobbying. What interest group in America does not lobby? It is as American as apple pie. The fault lies in the innumeracy of the decision makers in California. Lots of other public pension systems in the US are **DOING JUST FINE**, because they haven’t caved to the yapping of lobbyists. And the 401(k) system in the US is horrible… high fees, ability of those who run the funds to charge for trips to the Kentucky Derby to 401(k) fees, etc. You bet fleets of investment bank lobbyists are doing the same thing that labor lobbyists are doing, because the investment banks see a bonanza in DC plans. The best solution is DB plans run by sober, hard-nosed, dedicated, public-minded people. All over America there are those DB plans. I should have added that Pacific Grove also owes 27.5 million dollars for pension bonds at a cost of about 1.9 million dollars a year thru 2029. The integrity of its pension plans is beyond repair. Its financial expert indicated that in three years it will have a budget deficit of 3.1 million dollars. It has zero reserves, but the city manager and the council through the mayor, persist that a one month positive general fund balance, which is subsequently spent per the budget, is a reserve. The city financial experts and GASB ( a true reserve is “unassigned” funds) disagree with the city manager and the council. The PERS position is quite understandable, and it’s not a Ponzi scheme. As long as you have active participation, you can use higher-risk (and higher-return) investments. Yes, if returns fall flat for a while, there may be a need (perhaps temporary) to increase contributions. The same thing happens in your 401K while you’re still working. But on average (over a large group of members of varying ages) it works out. That’s the power of large numbers, not a Ponzi scheme. PERS has in fact averaged the expected 7+% over a long term even though they haven’t over some short year periods. County systems work the same way, though with smaller fund pools requiring more careful attention to investments – where attention wavers or poor investment choices are made, county systems can have big problems quickly. Now think about what happens if you close the system. Same thing as when you retire on your 401K. Now you have to go risk-free, because you’re on the hook for payments with no further income outside (you’re no longer working!). That doesn’t allow higher-return investments any more because you can’t afford to take any loss, even a small one. Remember, a 50% loss in investment value requires 100% gain to make it up, to break even; you can’t do that if you have no other income and have to play it safe. In the current market, I suspect even the 2.98% mentioned in the article is on the optimistic side – few Treasuries (the benchmark for risk-free) even come close to that. The people who are trying to shut down pension plans are people who don’t understand (or want to understand) the finances; people who want the money for themselves (by running substitute or 401K plans); or people who DO understand the finances but are lying in order to achieve some other goal (like breaking unions). If a city succeeds in “breaking free” of pensions completely, it will have to pay employees at least as much more as the pension costs – probably more, to allow for adequate personal retirement plans – to employ people who are interested in making a career there. The retirement benefit isn’t a gift; it’s part of the salary package. Something got lost in editing my post – my fault not calpensions’ – in the 3rd paragraph: Moving to a fixed-income no-risk approach means is that you need more money to generate a specific dollar return than you do when operating with growth and higher risk investments. So what the “termination penalty” does is add enough money to the account that the committed payments can be made without further income. Completely standard approach – it’s not a ripoff. And only needed if you terminate the plan so there’s no more outside income – just like your 401K after you retire. I’m none of the above. Some of us are against large pensions because the corrupt axis of CalPERS and short-sighted politicians has put us deep into a financial hole unnecessarily. Modest pensions enough for pensioners to live on– great! Tens of thousands of pensioners receiving $100,000+ while municipalities and school districts cut basic services and law enforcement drastically– no way! I agree with you in terms of the highest pension amounts – which are tied of course to salaries (and too many gimmicks, especially with local governments). You fix that by fixing the way that salaries are set, not by eliminating pensions for those who already have them. The vast majority of pensioners get well under $100K a year. The final salary for most state employees, even at supervisory rank, is less than $100K and usually less than $60K – over median for the state (and under median for most coastal communities) but about right for Sacramento. Yes, a CHP officer who makes it into management and works all the angles can pull down $150K or more at 55 or so after 30 years, but there aren’t a lot of them. If local agencies are bankrupting themselves by paying (including pension accrual) far more than state rates for ordinary jobs (which some are), then they need to think about why they’re doing that and fix it going forward if necessary, not just dump people on the street after the fact who are already collecting a pension for their past service. BTW, “going forward” can certainly mean, to me, changing how things accrue in the future for existing employees, in either direction. If you haven’t retired yet, the terms of your employment, including future pension accrual and contributions, can be changed through an appropriate process. The Feds and many private businesses are witness to that. If you’ve already retired, you’re no longer part of that process and should not be affected by it, though I might be a bit flexible for cost of living increases on the truly stratospheric pensions (say, over $150K). mreky… one overlooked fact, that during economic downturns, contributions will need to be increased to edgy DB plans. At the precise time that the electorate is hurting. That is really bad politics… coupled with the fact that CalPERS etc *raised* benefits during stock market upturns, driving a good portion of the need for extra contributions during the downturn… CalPERS has shot itself in the foot. When CalPERS moved out of fixed income back in the 1970’s they accepted the consequences of volatility. They didn’t manage those consequences well. Yes, higher return securities enable increases in DB payout. But not by as much as CalPERS promised, due to the political consequences of volatility. For new employees, the state has returned to more or less what they offered before 1998-99, but with more restrictions on health care. IMO they could have done that for future accruals of existing employees too (what you have vested can’t be taken away, but what about conditions of continued employment…), but that would have required brutal labor negotiations – perhaps not worth the effort. Local agencies could do the same if they think the can get away with in in their own situations. Private business pensions were into stocks etc. way before PERS. It’s the only way you can make the kind of average return needed to keep contributions reasonable and keep up with inflation. While you’re working, you have your 401K in stocks too, right? Yes, pension formulas were increased in an excess of optimism (and a flurry of lawsuits) in the late 1990s without taking the prospect of a downturn, particularly one as bad as in 2007-9, into account – a bad move with 20/20 hindsight. Doing that then granting contribution holidays to employers made it worse – essentially similar to corporations stripping the “excess” earnings from pensions in good times. Now we have to make up for not only the higher pensions (manageable, in most cases) but also the loss of investment capital (it’s gone, Jim) needed to cover them. Frankly, the real problem I see, which may well bankrupt me personally later in retirement, is health care. Practically nobody made investments to help support health care promises to retirees, so the naturally growing burden is on current cash flow. Dumb, but done. Should start saving now for the people who will retire in 20 years, but for most of the Boomers we’ll just have to deal with it. I expect health care, whether Obama-, PERS-, Medi-, or otherwise, to become a bigger problem than pensions in 10-15 years, with much of the shortfall dumped in the retiree’s laps. That’s probably a subject for another column, and if I recall correctly has been discussed before. A big exception is the state had a mandatory tier 2 for new employees prior to 1999. It required NO contribution from the employee, but the formula was about half the tier 1 formula. Something on the order of 1%@60. I’m not sure of the status of tier 2. As I understand, some of those pre 99 employees are still in tier 1, some were allowed to switch to tier 2 by “buying back” previous service. I think, but am not sure, that tier 2 is still available as an option for new employees. Correction: ” some of those pre 99 employees are still in tier 2, some were allowed to switch to tier 1 by “buying back” previous service. From what I just read in CalPERS booklet, tier 2 is still available as an option for new employees. The formula is 1.25% @ 67. Before, it required no member contribution. After Jan 2013, requires member contribution of 1.5%, which may increase until the employee is paying half the normal cost. Which brings up the question, can cities offer an optional (voluntary by the employee) retirement plan, either tier 2, or DC, without running afoul of CalPERS? Is this a Sat Nite Live parody? This affluent little town has a pay only $110k a year — a mere 4% of budget — to meet their pension obligations yet they bemoan such a horrible burden on their taxpayers? Oh, the horror of it all. Quit complaining Mayor, CalPERS is a bargain for you. This is just a partisan political stunt meant to appeal to the town’s conservative base. I immediately thought of spension when I read this. And the headline is so ironic. I don’t advocate dumping people and pensions on the street without due process. To me, barring negotiating (and in our state, due to the stupid judicial precedent of virtually irreducible future pension accruals, the negotiating deck is stacked in the favor of the financially irresponsible) bankruptcy is the most just forum to resolve these unsupportable burdens. In that process all stakeholders– taxpayers, bondholders, current employees, and pensioners– have their concerns addressed and with some (presumably) just distribution of pain apportioned. I also happen to think that pensions should be designed with a maximum annual amount. I would fix that at the median income for a single worker or the median household income of the locality in which they worked. Even though the number of high pension earners may be small, they have an outsized effect on budgets. For example, a few years ago I determined, through the online $100,000+ pension database, that 7 retirees of a local school district received pensions whose sum represented $1 out of every $72 of the total budget of that district. That is crazy! We owe workers a modest pension to live on, not a bonanza for the remainder of their natural lives. If retirees want to live on a $100,000+ in retirement, they should invest their own funds to make that happen. Gee, rightwing Orange County nutball claims public employee pensions are unsustainable. Dog bites man. This doesn’t meet the definition of “news.” Why even put it here? A higher level than the bill of rights. It is called rentseeking.